Reporter: So, the first question. How would you justify a smaller amount in sweeteners handed out to the grass roots and a relatively smaller amount handed to the middle class, as some have criticised you, and especially with the surplus and the reserves keep scaling new heights? That's the first question. And the second question is, I know it's teamwork, but specifically in what way have you contributed to this Budget, or is it largely passed down to you by your predecessor? And the third question, how do you like this job one month into office and how about another five years in office? And the final question is for Professor K C Chan. How would you comment on your current boss as compared to your previous boss? Financial Secretary: As I said earlier, the Budget is the collective effort of the whole team. In the past four and a half years in the Government, I've come to realise and I fully endorse the work of a Principal Official is indeed motivating the colleagues together and working together as a team. If we are able to work as a team, we can achieve the most. So I would not seek to distinguish in this particular Budget which part is contributed by me, which part is contributed by my colleague. I think my colleagues would agree with me every word written here represents our consensus. As to the relief measures, the amount is comparable to what were offered last year. People may not be very happy if they think that, given the larger amount of surplus this year, they would have expected a larger amount of relief, say for example in the form of tax relief rebates. But I would like to ask members of the public to look at our surplus in the following perspective. Let's first look at the nature and source of this surplus. The majority of the surplus are property-related. $50 billion from land sale, $8 billion from stamp duty - both are property-related. It is of a more non-recurrent nature. So it would be irresponsible to use this surplus to commit the Government to any long-term measures. And then I try to appropriate this surplus for different uses. I try to take into consideration, number one, what is the external and internal economic situation. 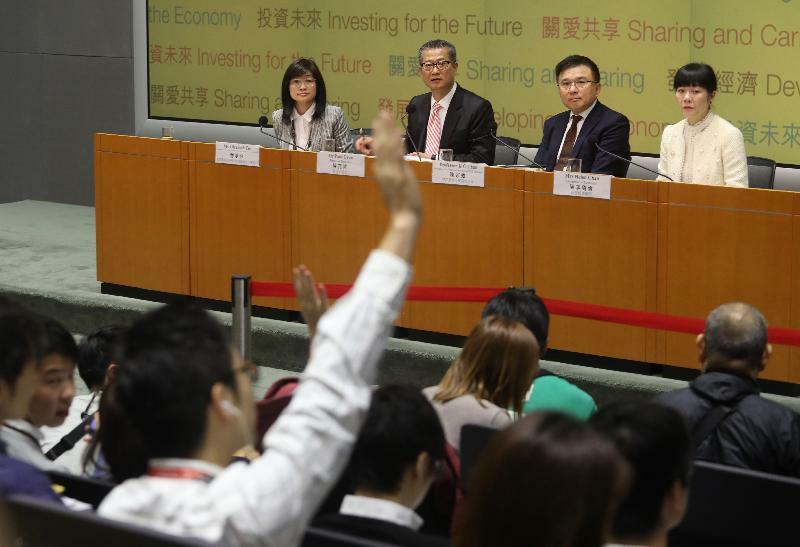 Do we need to have measures to be put in place to stabilise the economy to support the employment of the Hong Kong people? I would also look at what are the future needs of Hong Kong, and then what are the expectations of members of the public, and try to make a balanced distribution. So the way we deal with it is to use about $35 billion in the form of various relief and rebates, and leaving aside over $60 billion to invest in the future: half of it, $30 billion, for our elderly and the disability groups; $20 billion for sports development, community facilities which are projects people in the different districts have been longing for a long time; $10 billion to help the development of the innovation and technology sector; and $1 billion for youth development. So, hand on my heart, this is what I consider to be a balanced use of this surplus catering for both the short-term expectation of the community and the long-term needs of the community. Secretary for Financial Services and the Treasury: Since you asked a question to me and after Paul’s speech, I will mention it. I think, of course Paul mentioned that this being a collective project, but I think of course, the Financial Secretary is responsible for it and I have to say that Paul has really done a very good job. 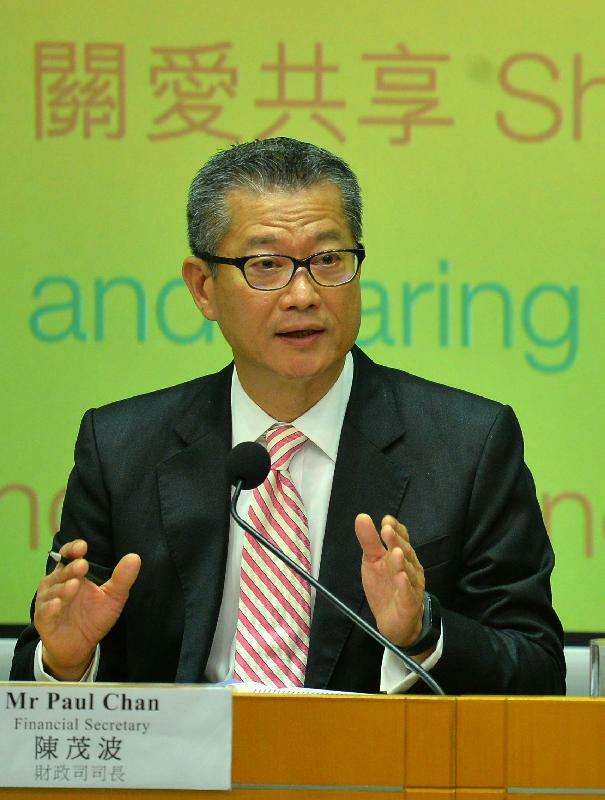 You can see from the Budget, it’s a very thoughtful analysis of Hong Kong’s situation and I have to say that even though you know, we have been working on this for some time, I appreciate a pair of fresh eyes like Paul’s to look at the Budget. 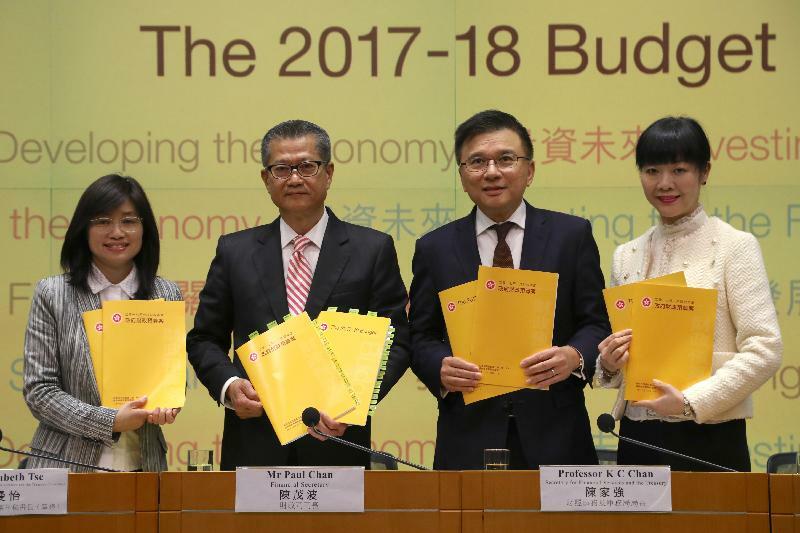 At the end of the day, I think the Budget really reflects Hong Kong’s situation and of course the priorities as Paul has outlined are reflected in the Budget. Reporter: Mr Chan, all the political parties were very critical of your Budget. Let's say the Federation of Trade Unions, they used the words that you are sitting on the money - they said "守財奴". They accuse you of being a caretaker secretary, that you do not have any vision for how you spend your money going forward. How can you respond to that? Do you think that's at all a fair criticism? And secondly, in the past the Government has always been criticised for failing to give a proper estimate in terms of its surpluses or deficits in the years ahead. How can you convince the public that your forecast this time is actually going to be accurate, and especially when you are having a deficit in the year 2021-22? Thank you. Financial Secretary: Well, in preparing this Budget, in terms of making the mid-range forecasts, we have updated the assumption in respect of land-sale income, which now is 3.3 per cent of our GDP, which is the 10-year rolling average - in the past 10 years, land sale revenue as a percentage of GDP - as compared with the previous one which is 30-year average, being 2.8 per cent of the GDP. As to the income side, the revenue from tax and other sources are forecast to be in line with our GDP growth. So, that is the income side of the equation. As to the expenditure side, which is a little more predictable, we estimate this by reference to the various measures announced by the Government. No one has the crystal ball to say with confidence that his estimate will be accurate. This is simply not possible. But we have done our best according to the information and data available to us and do it to the best of our ability. You talk about the criticisms against this Budget. One quotation just comes to my mind, I forgot who said that: You got enemies? Congratulations. That means you have at least done something right in life.